The repulsion-induction motor starts on one principle of operation and, when almost up to speed, changes over to another type of operation. Very high twisting forces are produced during starting by the repulsion between the magnetic pole in the armature and the same kind of pole in the adjacent stator field winding. The increases rapidly, and, if not stopped, would continue to increase beyond a practical operating speed. It is prevented by a speed-actuated mechanical switch that causes the armature to act as a rotor that is electrically the same as the rotor in single-phase induction motors. That is why the motor is called a repulsion induction motor. The stator of this motor is constructed very much like that of a split-phase or capacitor-start motor, but only run or field windings are mounted inside. End bells keep the armature and shaft in position and hold the shaft bearings. The armature consists of many separate coils of wire connected to segments of the commutator. Mounted on the other end of the armature are governor weights that move push rods that pass through the armature core. These rods push against a short-circuiting ring mounted on the shaft on the commutator end of the armature. Brush holders and brushes are mounted in the commutator end bell, and the brushes, connected by a heavy wire, press against segments on opposite sides of the commutator (see Fig. 12-12). 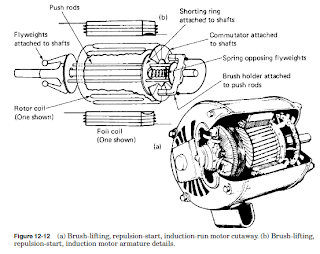 When the motor is stopped, the action of the governor weights keeps the short circuiting ring from touching the commutator. When the power is turned on and current flows through the stator field windings, a current is induced in the armature coils. The two brushes connected together form an electromagnetic coil that produces a north and south pole in the armature, positioned so that the north pole in the armature is next to a north pole in the stator field windings. Since like poles try to move apart, the repulsion produced in this case can be satisfied in only one way: the armature turns and moves the armature coil away from the field windings. The armature turns faster and faster, accelerating until it reaches what is approximately 80% of the run speed. At this speed, the governor weights fly outward and allow the push rods to move. These push rods, which are parallel to the armature shaft, have been holding the short-circuiting ring away from the commutator. Now that the governor has reached its designed speed, the rods can move together electrically in the same manner that the cast aluminum discs did in the cage of the induction motor rotor. 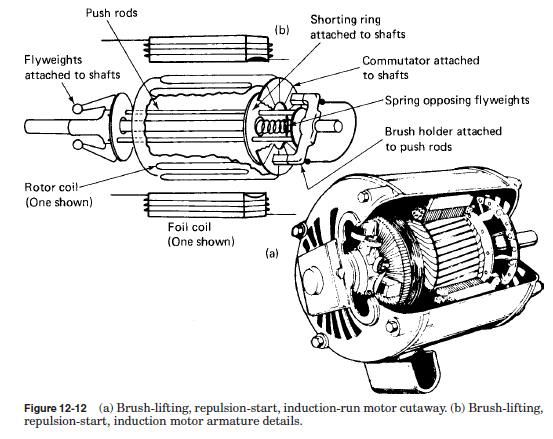 This means that the motor runs as an induction motor. The repulsion-induction type of motor can start very heavy, hard-to-turn loads without drawing too much current. They are made from 1/2 to 20 horsepower. This type of motor is used for such applications as large air compressors, refrigeration equipment, and large hoists and is particularly useful in locations where low line voltage is a problem. This type of motor is no longer used in the refrigeration industry. Some older operating units may be found with this type of motor still in use.